Panel #1 of Lawrence’s Migration Series © 2015 The Jacob and Gwendolyn Knight Lawrence Foundation, Seattle / Artists Rights Society (ARS), New York. Photo courtesy The Phillips Collection, Washington D.C.
What are the greatest achievements in American arts on the theme of migration? John Steinbeck’s The Grapes of Wrath comes to mind, as do Dorothea Lange’s photographs of migrant farm families. 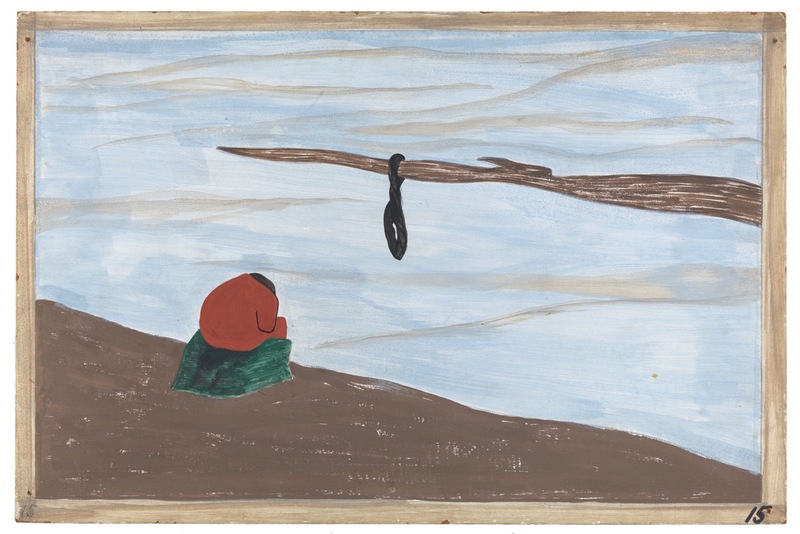 I would add Jacob Lawrence’s Migration Series now on show at the Museum of Modern Art in New York. In sixty small panel paintings, Lawrence narrates the movement of millions of African-Americans from the agricultural South to the industrial North. This migration began in earnest during the First World War, when a shortage of workers in northern cities presented new employment opportunities for black Americans. The massive shift continued into the 1970s, but Lawrence created his series in 1940, just before the United States entered the Second World War, sparking another wave of northern migration. The series is thus a kind of hinge, representing past events that remained meaningful for another thirty years (and, in many cases, to our own time). It appeared when the achievements of African-American artists, musicians, and writers were receiving wider attention than ever before. Migration Series was immediately seen as a major work, and in 1942 the panels were purchased by two institutions: MoMA and the Phillips Collection in Washington, D.C. Seeing the series together in one room is a rare event. At MoMA, smaller rooms surround the series, each one exploring a different context (literary, musical sociological) in which to consider and appreciate Lawrence’s multifaceted masterpiece. Lawrence was a rising star in 1940. He had already created series of paintings that explored the lives of the hero of Haitian independence Toussaint L’Ouverture, the former slave turned writer and politician Frederick Douglass, and the great abolitionist Harriet Tubman. While his paintings show the influence of Cubism and other modern art movements, the strong narrative element present in his major works seems out of step with his more famous contemporaries. This may have more to do with the way museums and academics often tell the story of 20th-century art — highlighting champions of the abstract and geometric, downplaying those artists who overtly brought social and historical forces to bear on their art. As the exhibition thoughtfully shows, American audiences seem to expect narrative and social commentary from literature (like Steinbeck) or photography (like Lange), but less so in painting. 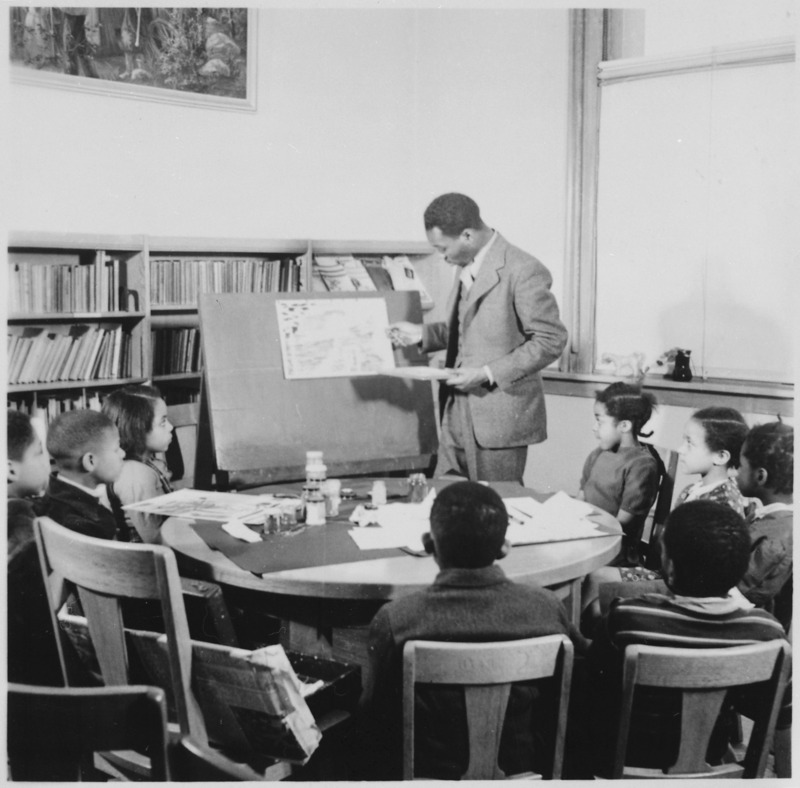 Jacob Lawrence with students at the Abraham Lincoln School. African-American writers such as Langston Hughes and Countee Cullen were already exploring the theme of migration in their works, and Lawrence was reading and meeting these older writers. Indeed, the exhibition’s title, One-Way Ticket, is also the title of Hughes’s 1949 collection, for which Lawrence provided images: “I pick up my life / And take it away / On a one-way ticket—/Gone up North, / Gone out West, / Gone!” But Lawrence was also reading deeply into the history of African-American migration, regularly visiting the public library on 135th Street in Harlem. The experience of reading and viewing evokes the experience of following the Stations of the Cross in a Catholic church, or seeing medieval images narrating the life of a saint. At the same time it calls to mind contemporary media, like books of photography that include a few lines of accompanying explication on each page (Richard Wright and Edwin Rosskam’s 1941 Twelve Million Black Voices, on display in the exhibition, provides a good parallel), or the juxtaposition of images that was becoming a familiar element in cinema. Two consecutive panels underline the importance of seeing the series together. Panel 6 represents the interior of a train carriage. People crowd every seat, covered in blankets and trying to sleep. One woman feeds her infant, her suitcase open in the aisle. The image is quite geometric, like three columns, a door at the end of the centre aisle column anticipating the end of the journey. The next image, Panel 7, is one of the most abstract in the series. It represents the rows of crops that the migrants have left behind—rows of green flames intercut by lines of brown and red that suggest the pathways between. But coming immediately after the carriage scene, it also conjures the movement of the train: those rows of seats have transformed into the view of a moving landscape, perhaps the view of a passenger who has stepped to the back to watch the southern landscape pass by. Lawrence’s images of the North express the ambivalence of the migrant. These urban centers offered better food and better work in steel mills or railways, but migrants also experienced unhealthy living quarters and more subtle forms of racism: Panel 49 shows a restaurant separated into sections for white and black customers. The migrants also experienced race riots in the North, in part because African-Americans were used as strike breakers. Panel 15: “Another cause was lynching. It was found that where there had been a lynching, the people who were reluctant to leave at first left immediately after this.” © 2015 The Jacob and Gwendolyn Knight Lawrence Foundation, Seattle / Artists Rights Society (ARS), New York. Photo courtesy The Phillips Collection, Washington D.C. But the overriding feeling created by Lawrence’s series is the excitement of movement and the inexorability of change. Like the survivors of the Dust Bowl, who left the Great Plains for the West Coast, African-Americans transformed their new homes in the North. Lawrence’s great achievement is to capture that phenomenon in all of its complexity, and to present it in an aesthetic style that is instantly recognizable as his own. 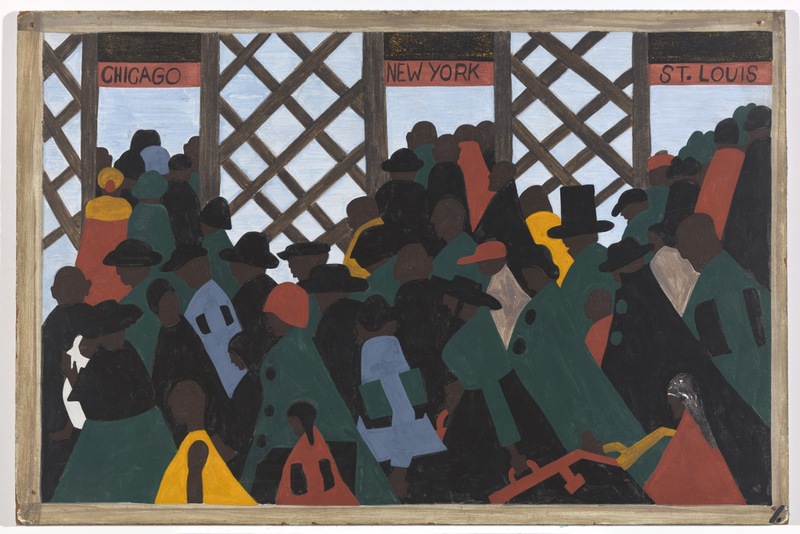 One Way Ticket: Jacob Lawrence’s Migration Series and Other Works is at the MoMA in New York City until September 7, 2015. Further Reading: The New Yorker recently wrote about the background to the Migration Series. You can also learn more about the life of Lawrence and his wife, artist Gwen Knight Lawrence, through the Jacob and Gwen Knight Lawrence Virtual Resource Centre, which includes biographical information and teaching resources. Australian readers will think of Sydney Nolan’s great Ned Kelly series, also produced in the 1940s, but I cannot think of another major American artist who produced such a successful series. Thank you. This is one of my favorite series of paintings. I first saw it in Chicago over twenty years ago and was as moved to see it again. The spareness and color of these images–and of Lawrence’s work in general–carries an incredible emotional impact. I wonder about what’s happening to Harlem today, though….